If you’re looking for a gluten-free version of eggplant parmesan, try our pecan encrusted version. The sauce is also no fuss since it’s made in a blender. Slice Eggplant in 1/4 inch slices and place in bowl with water and a pinch of salt. Let stand for 15 to 30 minutes. Chop pecans in food processor or blender until medium-fine granules. In small skillet add pecans, parsley, salt and pepper and toast for about 3 minutes. Stir continuously while toasting. Set aside to cool. In a blender or food processor, add tomatoes, onion, olive oil, oregano, and red pepper flakes. Blend until smooth. If you prefer chunky sauce, pulse 2-3 times instead. Prepare 9 x 13 baking dish. Spoon 1/3 of tomato sauce on bottom of dish. Drain eggplant and pat dry. Brush eggplant with olive oil and dip into cooled pecan mixture. Place each slice on top of tomato base. 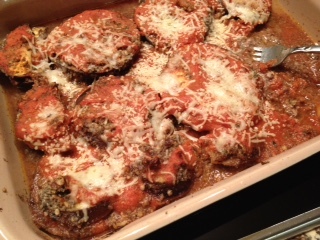 Add another 1/3 of tomato sauce on top of eggplant slices and sprinkle 1/4 cup cheese on top. Repeat to add another layer of eggplant on top of base layer and finish by adding last 1/3 of tomato sauce and remaining cheese.